You probably know these ideas, but knowing them doesn’t necessarily mean we remember to do them, right? Perception is reality. If you want to attract business, collaborate effectively, be comfortable walking into a room of strangers, and get along with people in general, the little behaviors matter quite a bit. Appearing poised and professional instead of anxious and amateurish is as easy as putting these five tips into action. Stand up straight – At just under 5’8” I’m not considered especially tall for a woman anymore, but growing up I felt taller than everyone (especially boys) so I slouched. Slouching doesn’t really make you look shorter it just makes you look insecure. Stand up straight. If doing so automatically makes you tense up, relax your face and shoulders. You’ll stay pulled up tall but without the tension. It’s a good idea to sit up straight, too. Make eye contact – Do this in all types of conversation; networking, meetings, during difficult conversations. Do it other times as well. Walking down the hall, interacting with the checker, passing people on the street, talking to the volunteer. People can’t tell if you don’t make eye contact because you’re shy or because you’re arrogant. Sadly, they’ll often assume the latter. But either one stinks. Look people in the eye and remove the chance for a negative impression. Smile – It’s impossible to frown when you’re smiling. 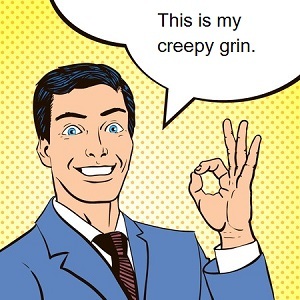 This isn’t a fake creeper grin that makes people wonder what’s wrong with you. It’s anything from a tiny turn up of the corners of your mouth to almost laughing (which we all need to do more of, too.) Smiling makes you appear more at ease and approachable. Smiling also changes your brain waves even if you weren’t in smiley mood before you made yourself smile. Bonus! You’ll actually be more at ease and approachable. Stop with the “like” and the “you know” – Those words are unnecessary fillers that make the speaker sound unsure and youthful — but not in a good way. The alternative is simply to pause, think, then speak. There’s no need to keep peppering the conversation with distracting and annoying no-content words. You can read more about that here. Slow down – Frantic people are usually in the habit of being frantic. Which I believe has happened because looking busy is somehow equated to higher value or importance in our society. Imagine walking into a room and noting two people in particular. One of them is darting about and talking rapidly and the other standing still and speaking at an easy pace. Which person would you assume has a more elevated role in the company or organization? None of these are difficult, right? Awareness and practice. That’s all it takes.